The art work shown above is one of a series of 12 Paintings. 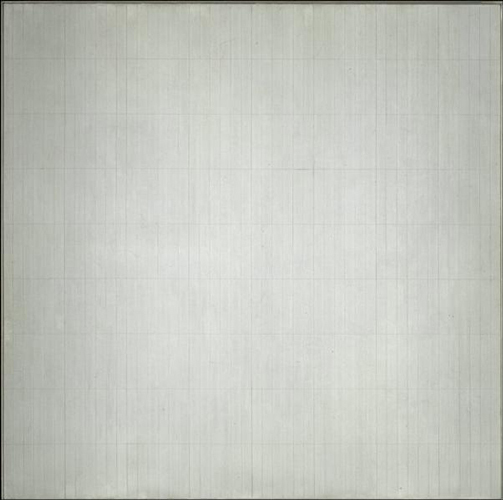 These twelve white paintings are shown together in the exhibition of Martin’s work that occupies the entire spiral of the Guggenheim Museum in New York. As reproduced in the catalogue they are indistinguishable from one another—simply white. In reality they are extremely distinguishable, as indeed every step we take in the world is distinguishable from every other. They refer not to universal order as, for instance, does Kasimir Malevich’s White on White, nor to the mortal dilemmas of Mark Rothko’s fields of contrast. They are rather fields of being, the perception and acceptance of life in all its worldly complexity. All twelve paintings are square. Each is articulated in horizontal bands--as few as four, as many as twelve—which become increasingly apparent as we move closer. These horizontalized fields of vision represent how we view the world and how we are in the world, then become total, infinite, though material realities, in which looking at them is really looking into, and being in, them. Generally speaking, we see the world from a vertical position, and the world we see (with our horizontal eyes) is horizontal—a landscape. In a very brief movie on view Martin is seen painting up and down with a brush. Still, the ruler rules, the instrument of horizontally. There are no diagonals, no one-point perspective measuring life into the distance. It is all there in front of us, in us. It is where she is, and like all great art, a real place. No matter how much we confront reality, and go beyond the surface, what we see is always surface, because there are always further surfaces. The Islands are about how much there is, not how little—islands in an endless space. Agnes Martin exhibition was on view at the Solomon R. Guggenheim Museum, New York, from October 7, 2016—January 11, 2017. Art Review - NYArtWorld.com - NYAW.co. All artwork is copyright of the respective owner or artist. All other material © Copyright 2017 New York Art World ®. All Rights Reserved.